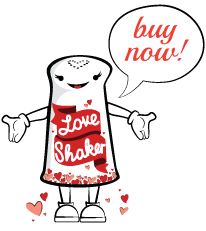 The Love Shaker is the perfect wedding and / or bridal shower gift. Give the gift of LOVE to honor the momentous occasion of marriage. This is a gift they’ll remember! 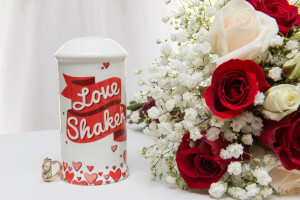 The Love Shaker can be the way each bridal shower participant can shower her with lots of LOVE. Pass the shaker like a microphone at the shower. 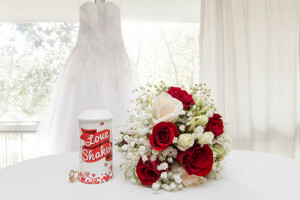 Each person can share their blessing for the bride with sprinkles of LOVE from the Love Shaker. The Love Shaker makes a great gift of LOVE for each bridesmaid as a token of loving appreciation for their participation. Shake LOVE on the couple as they walk down the aisle. The Love Shaker is a great addition to the wedding reception table decorations. Place a Love Shaker next to the flowers or centerpiece to add some LOVE to the meal. The Love Shaker is a great way to prompt sharing, storytelling and playful conversation among guests. People at the table can then shake to signal a toast or prompt a kiss for the bride and groom. The Shaker can be a romantic cue for loving kisses.